AJ @ MMG teamed up with NYC’s house music darlings Love & Logic for a fun mix of styles in the new single and video “Bicycle Seat”. Many bicycle shots (including close ups of ladies on bicycle seats) and bicycle sounds were used in the creation of this. This dance track was first placed in Love & Logic’s set last Winter at Miami’s Winter Music Conference, to a great positive response and hype. AJ guest appears in the video. AJ composed it, co-produced and mixed it, and is featured on a lot of the music performances, including a lot of the vocals. Vocals also feature Born I Music and Chris Love. Love & Logic “Bicycle Seat” – out now on Guesthouse Records. Produced, mixed and mastered by AJ @ MMG. 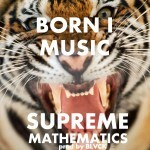 Born I Music – “Supreme Mathematics” single (prod. MMG) coming soon. King’s Landing Vol 1 CD drops soon. Posted on March 10, 2015 in: Articles, News, Production, Uncategorized, Videos|Comments Off on Born I Music – “Supreme Mathematics” single (prod. MMG) coming soon. King’s Landing Vol 1 CD drops soon. They called him infinite when he was BORN. He is @BornIMusic and he is TAKING BACK HIP-HOP. Wake up. Stay woke. The media blast for Born I Music’s first official single and video “Supreme Mathematics” for the upcoming CD “King’s Landing Vol 1” launches today. The Hip Hop community, at its highest levels, are now officially informed. Executive / Principal producer A.J. Halpern of Monomental Music Group could not be more proud at this commercial and artistic achievement! MMG is proud to present the release Born I Music – Purple featuring Frenchie official music video on Universal / Protekted. This video includes a cameo wih Waka Flocka Flame! MMG lead produced the effort, creating a distinctive vocal sound, producing the voice performances, mixing and mastering the single. Born I Music links up with Waka Flocka Flame’s Brick Squad Millionaires in the club-ready collaboration PURPLE with Queen’s native Frenchie. “PURPLE” finds Born & Frenchie trading rhymes about living the fast life, beautiful women and still finding time to share wealth with the less fortunate. Produced by DMV powerhouse ProFessA, PURPLE is a classic example of Born I Music’s vision of unity among genres, styles and artists, Purple arrives courtesy of Universal Music Group/Protekted Records, G&D/Monomental Music Group, and the Immobiliari. Monomental Music Group (MMG) is proud to announce the debut of The Sisterhood on TLC (Tue 9/8). “Good Boy”, performed by uber-well known KPop artist Baek Ji Young and featuring rapper Yong Junhyung, composed and produced originally by AJ Halpern (MMG) and Justine Ok (Fiera Music) released today #1 on the Kpop downloads chart. Within a week, it cracked the Top Ten, rising to #4 for 7 weeks. We are so happy and relieved that it got “all the way there”, thanks to an incredibly talented team Double Side Kick in Korea.